Wakura was built by Kiichiro Kitamura of Wakura Town. In the Wakura Onsen with modern inn is lined, but is Togetsuan is really a small inn is located quietly near Togetsu Bridge, the oldest of the inn of Wakura, it has been known as a building of sukiya-zukuri . 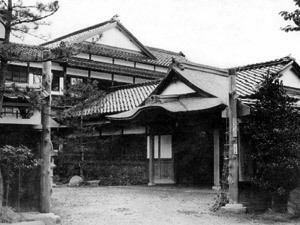 It is in the record that this famous poet and imperial family visited this building. From that time you passed through the gate, it will give you a feeling as if you were going back in time. A waveless sparkling glance outside the window also adds flowers to the traveling even more.Because I want to spend relaxingly forgetting the busy every day in Togetsuan, I cook incense with a relaxing effect.When you take a deep breath by being gently wrapped in the fragrance of incense, it will be time for a strange and more relaxing time to flow out than usual. The fragrance of the lively era in which masterpieces competed, still drifts, and thick beams and fine workmans have remained reminiscent of the incoming calligraphy crowded with onsen medical guests.In the wooden two-story room's interior space and overhead ceilings, luxury timber that is not currently available such as hinoki and Yakushima Cedar is used abundantly, and it is said that the technology is difficult to reproduce now. At the time of the renovation of Heisei (time period), I was trying to leave the air feeling inherited as much as possible from Taisho PeriodSo it is not a structure like a modernized building. There are retro cute decorations in the facility! Leave yourself to the space of exquisite gentleness that has given rise to numerous pieces, and enjoy the chic of the multi-storey shop called "Ishou no kenchiku". Inside the garden there is also a monument of the ninth repeat known as the author of "Tokaidochu-hizakurige" so please take a look once.